When it comes to sales, there's no such thing as "small talk." Conversations That Sell helps you make the most of every conversation. Today's buyers want more from sellers than a consultation. They demand meaningful, collaborative conversations that result in a Win3... where they, the seller, and the organization, achieve a winning outcome. Conversations That Sell outlines the what, how, and why of collaborative conversation skills needed to capture the buyer's attention and close business. Get Chapter One free here! A lot of time, money, and effort are invested in locating buyers through lead generation activities. Do your conversations with those leads pay off? Are you effective and efficient as you work with these buyers in conversations that value their expertise, knowledge, and ideas as much as yours? In Conversations That Sell you’ll find what you need to make each sales conversation count for the buyer … and yourself. 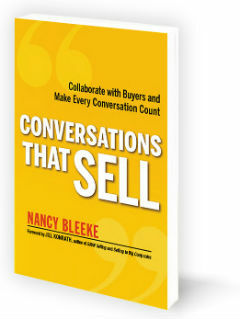 Nancy Bleeke, President of Sales Pro Insider, Inc, is a successful sales professional and sought-after sales trainer and has packed the book with valuable tools and examples. Salespeople in all industries will discover how to increase their short- and long-term sales success by making every conversation count as they keep the focus of every conversation where it belongs – on the buyer. Sales Pro Insider, Inc. provides sales and service training and tools that produce 5-25% sales increases within the first 60 days. Ready to enlist the help of a professional sales training team for your sales department? Click here to learn more.